The list is out. For a certain brand of cinephile, yours truly very much included, that can only mean one thing. Once a decade the British Film Institute’s Sight & Sound magazine polls the world’s leading film critics and directors, and compiles their list of the “Greatest Films of All Time.” This tradition started back in 1952, and has continued apace since then. Sight & Sound takes the measure of the cinematic canon every ten years so as to avoid momentary effusions and measure long-term trends. Other groups, most notably the American Film Institute, have crafted rival lists that hope to match the original for prestige and influence. The explosion of the internet has also created a surge of lists, from the venerable like They Shoot Pictures, Don’t They, to the ridiculous, such as the IMDb Top 250. 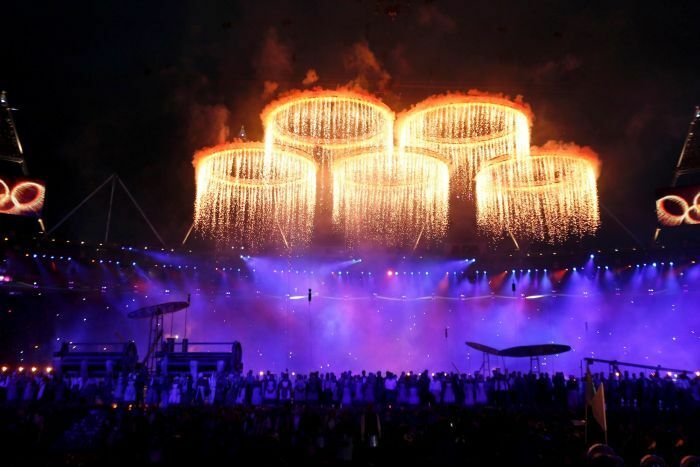 But the Sight & Sound list rises above them all, and today it unleashed something of a sea-change. So, Andrew, what are your thoughts on Kane being dethroned by Vertigo? Or is that not even where your thoughts landed when you saw the list? I have been disappearing a lot lately, slipping off by myself for hours. My wife has definitely noticed, and I know that some of my friends have taken note. It’s hard to reach me when I disappear, and ever harder to drag me back to the rest of my life and my roles and responsibilities. The place I’ve been disappearing to? It’s the northern-most province of the continent of Tamriel, a land a mountains ,mist, snow, and stone. Its rivers run clear and fast; its weather is frightful and harsh, surpassed only by its ever-present predatory fauna. It’s a place called Skyrim, and it is entirely fake. 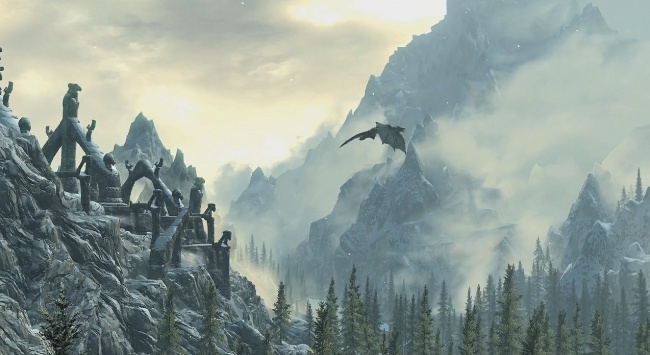 Like many others in the past several months, I have flung away untold hours—hundreds and hundreds of hours—to Bethesda Softworks’ The Elder Scrolls V: Skyrim. A single-player role-playing game (RPG) set in the above-described land during a period of political strife and apocalyptic tidings, Skyrim is in many ways an archetypical American fantasy RPG. I’ve always enjoyed video games, and in my first few years in high school, I was an enormous fan of high fantasy of this sort, but things change. I left behind fantasy at some point, enjoying The Lord of the Rings when it came on TV, but devoting more of my interest to the generic pleasures of art cinema and Westerns in recent years. Video games have remained a constant, but in the past few years my gaming time had been more or less exclusively devoted to three product types: NCAA Football from EA Sports, Sid Meier’s Civilization, and Rockstar Games’ open-world action games like Grand Theft Auto and Red Dead Redemption.Why I wanted to try out Skyrim I cannot precisely say. The TV ads were well made, but so are those of many other video games, and this material did not intrinsically speak to me. There I was on a random evening in December though, walking a few blocks to rent Skyrim from a Redbox stand. I have been missing real life on and off ever since that night. Question: You’re teaching a class in popular culture, literature, or the like. As part of your curriculum, you need to incorporate one graphic novel or comic book series, and only one. Which one do you use, and why? I have to admit that I am not nearly so versed in graphic novels and comics as J. and Andrew. Certainly, I enjoy them, but I have never made it a point to explore them in full. Thankfully, I actually do teach courses where I would encounter just such an predicament as J. laid out in his prompt, so I have an answer all ready to go. My choice if I were to teach one graphic novel in a course would be Ghost World by Daniel Clowes. It’s the story of two disaffected teenage girls, Enid and Rebecca, drifting through their post-graduation life with an excess of ennui and a distinct lack of direction. As written and drawn by Clowes it’s the type of works that feels at once deeply personal and surprisingly universal. Certainly, not every student is going to see a direct reflection of their dyspeptic suburban environment, as I did when I first read it. But the feelings of discontent that both girls feel are undoubtedly universal, especially at that stage of late adolescence. Neither Enid nor Rebecca have big dreams in Ghost World, just a desire to find something meaningful to do, and maybe someone to care about without a protective layer of irony. Not exactly the Jay Gatsby-types, but Ghost World is a much more grounded work than Fitzgerald could have dreamed of. Ghost World isn’t set in the here and now anymore (it was published almost 20 years ago, ye gods…), but it depicts universal emotions in such a specific manner that I think it would resonate strongly despite any initial skepticism towards the form or its content. That reluctance plays into my decision as well. In my teaching experience, it has been a repeated delight to push new materials on my students when they expect not to like it. Screening films like The Tree of Life, Gegen die wand, or even Young Mr. Lincoln is met with groans and eye-rolls. Most 19-year-olds aren’t terribly interested in pushing their own cultural boundaries, and don’t expect to ever like anything they encounter in a classroom. Introducing a graphic novel that is not about superheroes, and which doesn’t make up for that with romance or drama, seems like a sure way to engender grumbling. So when it comes time for class discussion, it is deeply gratifying to hear “I expected to hate it, but that was really interesting.” Not every reaction will be like that, obviously, but I fully expect that Ghost World would earn the remark from someone. Other graphic novels would do much the same, of course. But Ghost World means a lot to me, and half the fun of designing your own curriculum is making others experience things you enjoy, so it wins. Answering this question was rather easy. There are four graphic novels which have surpassed the level of merely “inspirational” for me, and then it became a process-of-elimination game. Jeff Smith’s Bone, which I have written about before, is at 1,332 pages—and every one of them densely packed—too long for this purpose. As much as I love Fun Home, Alison Bechdel’s work increasingly tips the balance in favor of words over pictures when they should be ideally equal. And Craig Thompson’s Blankets, even though it is the only comic which has ever made me weep, got crossed off for an odd reason. Even though Thompson’s illustrations are of the highest aesthetic caliber, I realized that except in a few places (the breathtaking, I’m trembling just thinking about it image of Craig and Raina’s bodies fused together, for example), the pictures and design augment the impact the reader feels as opposed to being in a symbiotic relationship with the story to create that impact. 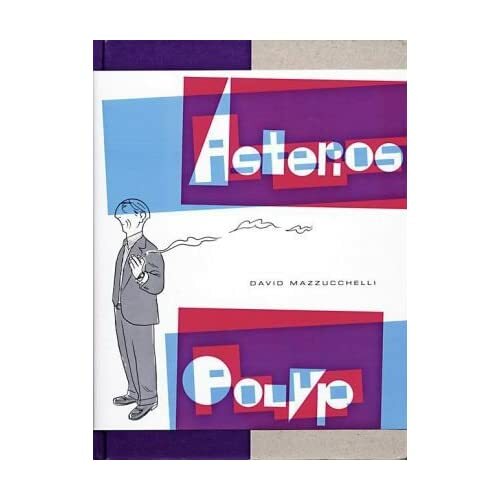 In comparison to these books, Asterios Polyp by David Mazzucchelli revels in displaying all that the graphic novel is capable of, when not going farther and actually pushing the boundaries. Every few pages, and sometimes in the same panel, Mazzucchelli will alter the paneling method, the color scheme, even the types of lines he is using to draw, creating a work which is as much a master class on how much variety lies in comics aesthetic and practice as Scott McCloud’s non-fiction titles. (Even Thompson sticks to the traditional one-panel-after-another form.) 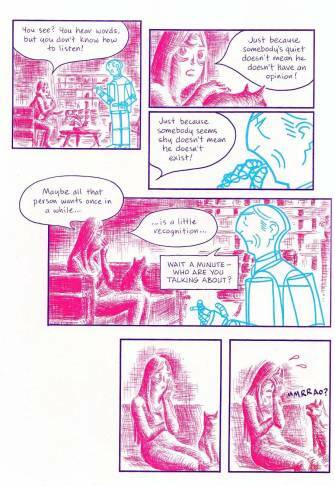 More importantly, Mazzucchelli is not showing off with this array of choices: every time his drawing and layout undergo a stylistic shift, it accompanies a change of scene and tone in the story; to take only one example, when Asterios and Hana have an argument, curvy florid red lines fill half a very detailed panel and blur into sharp geometric blue lines, reflecting the emotional distance between them. His words and pictures complement each other in a way very few texts in the medium have ever achieved. But Asterios Polyp is more than a technical marvel. Mazzucchelli also tells a profound and gripping story laden with philosophical and romantic themes, and tells it with all the skill of a great novelist. He ties together multiple plotlines and uses recurring details in ways which make one want to immediately start the book over once finished. Best of all, the storytelling feels impossible without the illustrations. I cannot spoil anything, and do not even wish to talk about the plot to any extent. I will say that on the very first pages, a scene occurs which grows more and more laden with meaning as the reader discovers the many facets of Asterios. The scene’s significance could have been described with words alone, but I doubt this possibility…and even if it could have, it would have been far more difficult and hard to convey without Mazzucchelli’s well-chosen, ultimately heartbreaking imagery. Asterios Polyp combines superb storytelling and pictorial artistry of the most innovative sort, and does so in a way which displays how words and pictures can work together in the best ways and not merely sit side by side. If I had to teach one graphic novel, pick only one which could encapsulate all that is wonderful and possible with the medium, it would be Asterios Polyp. I came up with the “one and only one” limit to make this challenging for myself, and to the other sequential art geeks that may inhabit the Recorder’s editorial board. As someone who’s taken a university course that focused on nothing but comic books in culture, and presented a conference paper on them – and whose wife works at a comic book shop – the challenge is in the limitation. illuminate other facets of popular culture in its own unique manner. With that in mind, my series of choice would be Mike Mignola’s Hellboy. I’d prefer to utilize the entire Mignola-verse (Hellboy, BPRD, etc. ), but if I could only use one book, it would likely be Hellboy: the Conqueror Worm. Since there would be a heavy focus (in this hypothetical class I’m teaching) on genre fiction (Bierce, Lovecraft, Howard, Borges, García Márquez, Asimov, Pratchett, Gaiman, Hill), and the theoretical underpinnings of mythmaking & intertextuality (Campbell, Jung, Eco), I would want a superhero comic book that could easily connect with these foci. Tying the Mignola-verse together with these other readings is the easy part. Hellboy is a variation on our old friend, the heroic monomyth, but it also is a study in intertextuality. Mignola is very open about where he derives his stories from – whether he is retelling a piece of Asian or Celtic folklore, or utilizing the cosmic monsters (and their amphibian/human hybrid minions) that are a direct reference to Lovecraft’s Mythos. But more than intertextuality, there are other pop culture connections that can be taught via Hellboy. One is the difference in storytelling between media (say, the Hellboy / BPRD books, graphic novels, and films – as well as Geek & Sundry’s “Motion Comics”), and another is the conventions of the comic book medium itself. As fellow Addisonian Alex pointed out in our last Conversation, sitcoms always tend to wrap up by the end of the episode. That is, they are episodic – after the conflict is resolved (or pushed back), the fictional world returns to its neutral state in time for the next episode. Superhero comics are very, very similar. Even if a series-changing event occurs (e.g., death of a main character), at some point the series will only bend so far before that event must be undone or unwound (e.g., character comes back to life, or was not dead) — thus snapping the series back to its neutral state. The Mignola-verse series defy that convention. The author has acknowledged this defiance in a recent story arc, indicating that in these series, when something is broken, it stays broken. The first dramatic example of this was with Hellboy: the Conqueror Worm, wherein Hellboy is pushed into a situation that goes against his character. When the tale ends, this causes him to reject the neutral state, thereby moving the narrative beyond episodic conventions. That’s what Professor Bestul is offering up this semester. How about the rest of you gents? Read the responses from the other editors, Andrew, Bean, and Travis, as they are published throughout today. I’ve been wracking my brains for a few weeks on how to present this. ‘This’ being a discussion or analysis of tabletop games, a topic that, once upon a time, didn’t require the adjective in front of ‘games.’ But with the advent of video games, and the blurring of lines between sports and gaming (whether referring to betting, fantasy sports, or poker & darts on ESPN), I’ve felt that the grand tradition of tabletop games has become the long-lost brother of Western pop culture and entertainment. The goal of this series is to explore and analyze tabletop games in the same manner as other forms of popular entertainment — film, music, video games, books, and the like. It is not meant to be a ‘review’ of these games, but a means of bringing attention to and discussion of games in a popular culture forum (that is, the Recorder). This idea has been percolating in my brain for years, though the advent of the Geek & Sundry web channel (and its gaming series, Tabletop) brought it back to the forefront. 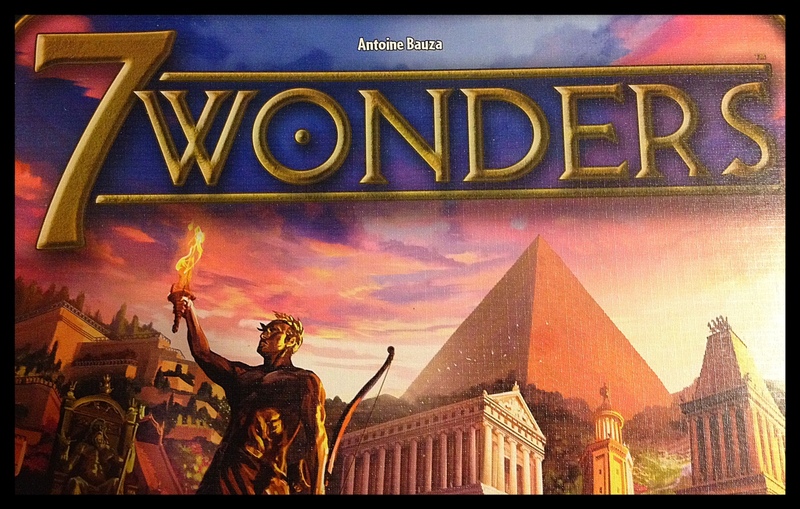 Thus, for the first entry in this series, I’ll hearken back to a game I briefly mentioned when I wrote about Tabletop and digital media: 7 Wonders. Check out all that Wonder. 7 Wonders is a recent and award-winning game from Repos Productions, wherein each player is takes the role of one the civilizations that built the Seven Wonders of the Ancient World (hence the name). It’s a game that rewards resource management and adaptability, and once the players get the hang of the mechanics, it plays exceedingly quick.